I hope everyone had a nice holiday weekend. It seemed to just fly by. The weather was pretty nice except for Sunday when it rained. We barbecued on Saturday and Monday. It was a nice relaxing weekend. I did take the time to remember all of the men and women who have given their lives so that we can live freely in this great country. Summer doesn't officially start until June 21, but I always think of Memorial Day as the unofficial start of summer. The last day of school for Rockwood was Thursday. On my way home from work, with the top down of course, I was behind the school bus in our subdivision. I could see the kids in the back of the bus literally bouncing up and down in their seats. When the bus stopped, one little boy leaned out of the window and looked at me and shouted "Last day of school...last day of school..." I grinned and said, "Woohoo." He smiled and continued bouncing up and down. I know exactly how he felt and it certainly brought back memories. I then heard the bus driver say, "OK, calm down back there." Mean bus driver...hee hee hee. Speaking of school, Newsweek released the list of top 1200 high schools in America last week. Lindbergh High School, my high school, was ranked 759 which means it is in the top 5% of all high schools in the country. Go Flyers! I wonder if any of the teachers I had are still there. I know that my favorite high school teacher, Mrs. Fanter is no longer there. She was Miss Harris when she was my 9th grade English teacher and yes, I still remember what a gerund is and when to use who versus whom. I also remember receiving a 3 in citizenship for the first quarter because I talked too much. Imagine that. In addition to the letter grade, a 1, 2 or 3 was given for effort and citizenship. For the first quarter, I received an A, 1 in effort and 3 in citizenship. I didn't think that it really mattered since I received an A but my parents told me otherwise. I tried the "but Renee, Yvonne and Angelia also got a 3 in citizenship" but that didn't work. That was the first and last 3 I ever received in citizenship. Effort was a different story. I think I received some 2's and 3's in various classes in 10th and 11th grade but that's a post for another time. Another 9th grade English class memory was when we had a substitute one day. Tim R. decided that everyone should change names so when the substitute called roll, everyone answered under a different name...hee hee hee. The substitute told Mrs. Fanter that we were so good...little did she know. I'm sure my sister, who is a substitute teacher in the Rockwood district, wouldn't appreciate it if the kids did that to her and hopefully my nieces and nephew know better than to do that. Josh, Amanda and Sarah DON'T DO THIS. The only other teachers whose names I remember are Mr. Medlin (9th grade Algebra), Mr. Sanchez (12th grade Spanish), Mr. Bivens (10th grade German for about 2 months until I dropped the class - again a post for another day), Mr. Elkins (11th grade English), Mrs. Topping (10th grade English) and Mrs. Graziani (11th grade history). Hmmm, I wonder if kids in high school still call their teachers Mr and Mrs. Anyway, three high schools in the Rockwood district also made the list...Lafayette at 601, Rockwood Summit at 675 and Eureka at 705. Pretty impressive! Today is my mom and dad's 50th anniversary. In this day and age, 50 years of marriage is quite an accomplishment. After the anniversary party, I realized that our family and friends are quite unusual in that everyone who was at the party is married and has never been divorced. This is the card that I made for them. Like the invitation, there is no stamping on this card, except for the sentiment on the inside which I embossed in gold. 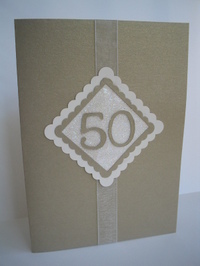 I used the brushed gold and shimmery white card stock from @Stampin' Up. I used the Marvy Uchida mega scallop punch to cut out a square and then used the giga punch and centered the smaller square to make the frame. I created a glitter window and mounted it on the shimmery white card stock. 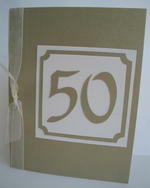 The Cricut was used to create the number 50. The ribbon was placed around the card and secured under the focal image. Now that I've had a chance to use the gold card stock, I'm definitely going to have to use it more often. Rachel Ray featured a youtube clip on her show the other day. You can click here to see it. How cute is he? His name is Spudgy. He's absolutely too cute for words! We had a party on Saturday for my mom and dad's 50th anniversary. Their actual anniversary is May 25. The party was at our house and we had it catered by Rich & Charlies. It was a lot of fun...just family and a few close friends. It was great spending time with everyone. The weather was great so the kids ate outside on the patio and then played in the yard after dinner. My mom and dad brought their wedding album. Of course the kids thought it was funny to see grandma and grandpa as youngsters. My dad also put together an album of pictures including my sister and I when we were little. The kids got a kick out of that too. I guess it's hard for kids to imagine that their parents, grandparents, aunts and uncles were kids once themselves. This is the invitation I made. Notice, there is no stamping. I created it using the Cricut and the @Stampin' Up ticket punch. The card stock @Stampin' Up brushed gold and shimmy white. I've never used the gold card stock before but it's really pretty. It's hard to capture the true color in a photo though but it's a very soft brushed gold color, hence the name...hee hee hee. Yes, I know. Mother's Day was two days ago and I'm just now getting around to posting the card I made for my mom. Rest assured, she did receive it before Mother's Day. I just had a hard time getting a good picture of it. Blue card stock seems to give me fits when I photograph it...same thing with purple. The colors don't show true or the background takes on a strange hue. I've tried several different photo editing programs and finally was able to get it to come out close to the actual color. The green is still a little off but it's much better than when I first downloaded the picture. OK, so enough about my photo editing troubles. I used Tempting Turquoise for the base. 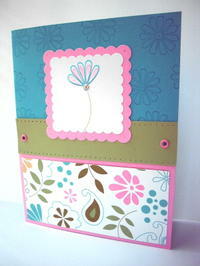 I used one of the stamps from the Polka Dots and Petals set for the top half of the card. A strip of Old Olive card stock was pierced and then added to the middle of the card. The bottom of the card is Pretty in Pink card stock and Petals and Paisley paper. The focal image is from the Polka Dots & Paisley set. It was stamped on white card stock and then punched with the square scallop punch. The larger square punch was used to create the mat with Pretty in Pink card stock. A small swarovski flat-back crystal was added to the flower for some sparkle. Two coordinating eyelets were then added (because my mom loves eyelets). All card stock, paper, ink, stamp and eyelets are @Stampin' Up. According to the organizers of the St. Louis Brewers Heritage Festival, St. Louis is the Beer Capital of the country. Since Anheuser Busch is headquartered here, I guess that has a lot to do with it. Anyway, the festival was so much fun. Upon entrance into the festival, we were given small glasses which we used to taste the various beers. There were two beer tents - the ale tent and the lager tent and the seven breweries showcased 63 different beers. I tasted beers from each of the seven breweries. Believe it or not, AB actually knows how to brew something other than Bud and Bud Lite...hee hee hee. Anyway, all of the beers were great. The only one I wasn't particularly fond of was one that Bill chose. It was a Smoked Beer by O'Fallon Brewery. It definitely had a smokey flavor to it. In addition to the beer, the food was great too. We had a crab cake sandwich from Sqwires and a huge (and I mean huge) pretzel from Harvest bakery. The festival was very well organized. I'm hoping that this becomes a annual event. Bill & I even talked about volunteering at the festival if they decide to do it again next year. 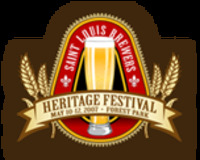 The first St. Louis Brewers Heritage Festival starts today and runs through Saturday. Brewers from Schlafly, Morgan Street, Augusta, Square One, Alandale, O'Fallon and Anheuser Busch will be showcasing their fine brews. In addition to being able to sample the various beers, we will even have a chance to talk to each of the brewers. Maybe they'll even give me their secret recipes...hee hee hee. We have tickets for the Saturday afternoon session from 12:00 to 4:00. I'm hoping that the weather will cooperate. Cheers! I'm an avid Captain & Tennille fan. I've been a fan since 1975...holy cow, that's 32 years ago. I am a wine and beer aficionado. My three favorite vineyards are V. Sattui (Napa), Mount Pleasant (Missouri), Tedeschi (Maui, Hawaii). As for beer, I love micro brews. My three favorite microbreweries are Schlafly, Morgan Street and Maui Brewing. I have been home brewing for the past three years. I currently drive a silver Miata. My first car was a brand new 1980 Firebird that my parents bought me for graduation. I have a Bachelor of Science degree in Business Administration from the University of Missouri St. Louis. I was only two classes short of a minor in German. At the time, I was just ready to be done with college and didn't want to invest the time in two more classes...silly, I know. Since I don't usually have the opportunity to speak German anymore, I have forgotten a lot of it over the past 22 years but I was able to understand quite a bit when we were in Germany in 1999. A lady in Germany said, "Hier zum essen" and I said, "Nein"...my husband then said, "what don't I want"...hee hee hee. I've been married for almost 21 years (6/14/86). If I could live anywhere in the world, I'd live in Hawaii, preferably on the island of Maui. I've been to Hawaii six times and have visited the islands of Oahu, Maui, Hawaii, Kauai, Lanai and Molokai. A Hawaiian resident told me that I should consider myself a kamaaina. I have lived in St. Louis county all of my life. I have been to 29 of the 50 states (even though a few of these have been limited to a layover at the airport - but heck, I still count it) and will pick up two more this summer (Oregon and Washington). My goal is to eventually visit every state. I enjoy these tagging games because it gives me the opportunity to seek out blogs that I haven't visited before. Be sure to click on the above links. Today is Toni Tennille's 67th birthday. You can check out her blog here. Be sure to stop by and wish her a happy birthday. We had to break out the snow shovels today. OK, it wasn't snowing. We had 2 yards of mulch delivered and we used the shovels to scoop up the mulch and put it in the wheelbarrel. Two yards of mulch dumped into your driveway doesn't look like a lot until you start filling the wheelbarrel. Ten wheelbarrelfuls later when you still haven't made a dent in the huge mound, you realize how much a yard really is. We always order a type of mulch called Black Forest. It's triple-ground so it is very fine with no huge chucks of bark and it's very dark in color. The price has increased during the last few years...it's now over $50 per yard but it's worth it. We have tickets for the Cardinals/Astros game tomorrow. Go Cards.